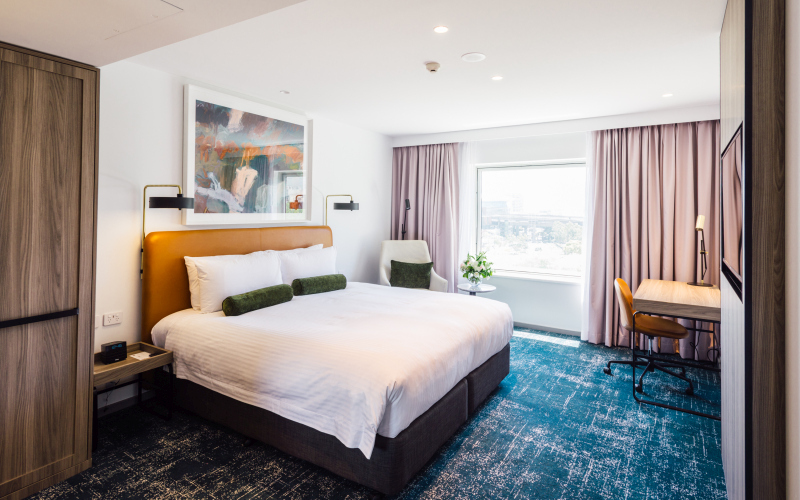 The Darling Harbour room is the hotel’s largest function room featuring natural daylight from floor to ceiling windows, dual data projectors and inbuilt sound system. The Pyrmont Bay Room is easily recognised by its unique arch windows, which provide adequate natural light into this intimate meeting space. Perfect for boardroom meetings that require additional spaces. The heritage listed Pumphouse Bar & Restaurant is a unique and versatile venue, perfect for your next event. Speak to our experienced events team about unique themeing and entertainment options. The downstairs area of Pumphouse is a relaxed area, featuring a spacious bar and fireplace. The mezzanine level of Pumphouse is perfect for cocktail parties or intimate gatherings. Inspired by the neighbouring Chinese Gardens, the colour scheme, finish and lighting of each guest room has been designed to capture the tranquillity of the gardens. Stay Warm This Winter with Novotel Sydney Darling Square's Hot Offer! For a limited time only, hold your next meeting with us and enjoy $69pp Day Delegate Package. Special rates from $219 per night, inclusive of buffet breakfast available upon request. Novotel Sydney Darling Square is conveniently situated adjacent to the Chinese Gardens, ICC Sydney. Guests are minutes away from many shops and restaurants of Darling Harbour, Cockle Bay and King Street Wharf. Novotel Sydney Darling Square is located in the heart of vibrant Darling Harbour. A contemporary 4 1/2 star hotel offering 230 newly refurbished accommodation rooms with Standard and Deluxe room types. The hotel features 24 hour reception and room service, an indoor heated pool, the new Pier St. Kitchen, Lobby Bar & Cafe and Pumphouse Bar & Restaurant. Novotel Sydney Darling Square offers state of the art audio visual equipment including high definition plasma screens, video conferencing and data projector. Novotel Rockford Darling Harbour becomes Novotel Sydney Darling Square as of January 2018.